With this guide, we hope to support you through this journey on the best way to control Myopia in today’s society. Controlling myopia is a lengthy but a fulfilling journey. More and more children around the world are becoming short-sighted (myopic). It is a concern for many parents whose children have this eye condition that seemingly gets worse every year. For these kids with myopia, special types of contact lenses have been shown in research and in clinical practice to be far more advantageous than wearing regular glasses. Not only do these contact lenses provide clear vision without the hassle of wearing spectacles, but they also help slow down a child’s progressive vision deterioration that occurs with myopia. In broad terms, the two types of therapeutic contact lenses that control myopia progression are orthokeratology night-time lenses and multifocal day-time soft lenses. Let’s take a look at these two options in more detail. Orthokeratology, or Ortho K for short, is a concept that has been around for more than 25 years and prescribed by thousands of specialty contact lens practitioners worldwide. Ortho K involves the precision fitting of a rigid contact lens to reshape the surface of the eye, the cornea, by a pre-determined amount to correct vision during sleep. The lens is removed on waking. 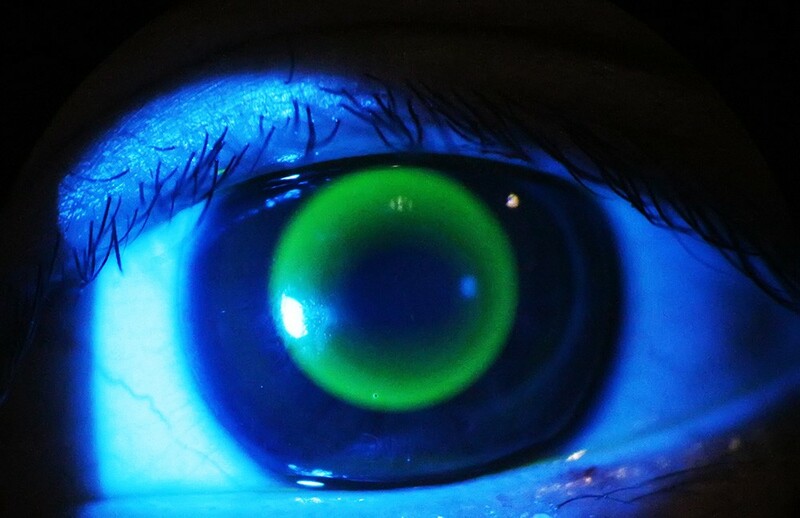 An Ortho K lens being assessed on the eye during the lens fitting process. Restores clear vision for the duration of the waking hours such that the child can be free from glasses and daytime contact lenses. Slows, and sometimes halts, the progression of myopia and vision deterioration over time. These two objectives are achieved by the reshaping process on the eye surface where the central area of the cornea is flattened (to restore clear vision) and the mid-peripheral area is steepened (to control myopia progression). This independent focusing of central and peripheral vision is an effect that regular glasses cannot achieve, which is the reason why Ortho K is effective in reducing the progression of myopia whereas single-vision glasses are not. 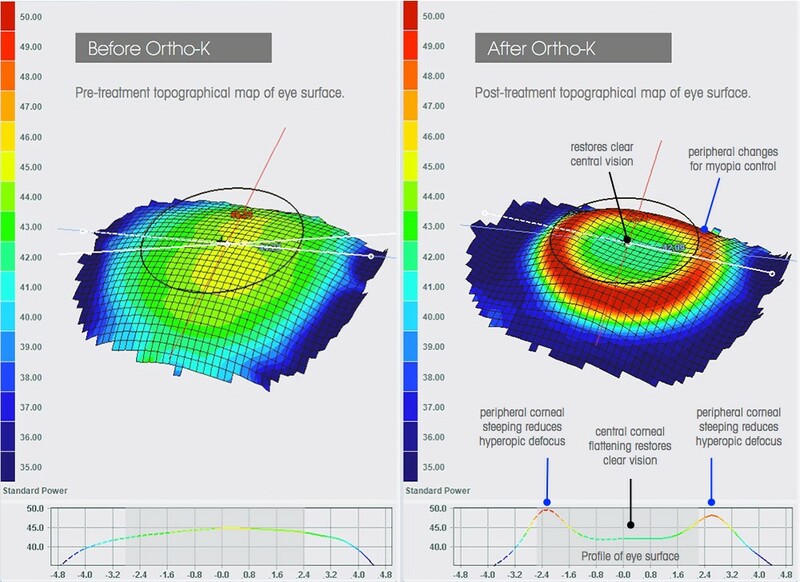 Diagram demonstrating how Ortho K corneal reshaping treatment works for myopia control. Multifocal soft contact lenses (MF SCL) are daytime lenses originally developed for presbyopia—the common condition affecting people over 40 that causes increasing difficulties with reading and near focusing. These typically have circular zones of different prescriptions within the lens to give simultaneous focus of far-distance and close-up objects in the eye. While there are various designs of MF SCLs on the market, recent research have found that particular designs, so-called ‘centre-distance’ lenses—where the centre zone of the lens gives clear far-distance vision and the peripheral zones help with close-up focusing — are also effective in reducing myopia progression in children who wear these lenses daily. As the diagram below illustrates, the ring-like distance and near optical zones of a MF SCL look somewhat like the treatment zones on the eye created by an Ortho K lens. A MF SCL is, in a way, mimicking the treatment effect of Ortho K.
A MiSight lens assessed on the eye showing the power changes in the lens as illustrated by the schematic. In Malaysia, where I practice, there are now one specially designed contact lens approved for myopia management: CooperVision MiSight 1 Day. It has just become available recently after more than 10 years of development. Usually, we will go through some of the considerations before deciding which contact lens option is best for a particular child. Next Post Two is better than One.